Vehicle loans give you a huge sort of relief, only until you miss a payment. Once missed, it could turn out to be a nightmare with higher interest rates and penalized levies. 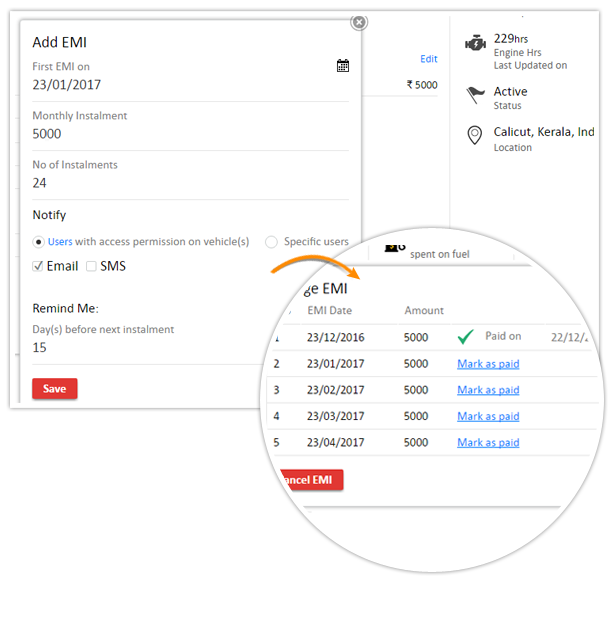 Get timely vehicle EMI alerts on your mobile or email by simply feeding the EMI details. Tilt alert; the system triggers an alert whenever the vehicle tilts (moves in a sloping manner) abnormally. Continuous driving alert; triggers alert when a vehicle is driven continuously for more than a user defined time (say, 4 hours) without taking a break period (say 15 minutes – customizable). Outside office hours; alerts you when vehicles are driven out of the office hours (user defined). (say, 12 hours) as defined by user. User based privilege to modify/delete service and fuel entries. Load all service entries on a go as an xls file, so you get to see your monthly expenditure with ease. Odometer reading included in tyre history log. Cost/Hr field added to Running cost report. Added 3 more fields to Expense sheet report; Odometer, Engine hours & Service date. Option to export incidents/accidents as an excel file. Update odometer readings of all your vehicles on a go by importing in .xls format. Introduced drop down menus for main menu tabs (Analytics, Service and Maintenance & Management) with multiple sub tabs, so you could avoid multiple clicks to go to a feature that lies in an inner page. You may now find a route from one of your vehicle’s location to your destination using ‘Get Directions’. Go to ‘MapView’ tab and choose the vehicle first to be shown on the map. Right click on vehicle, and you could view your vehicle’s location automatically pulled to ‘Get Directions’ feature on Right Pane Options. Note: To use this feature, ‘Get Directions’ must be enabled on Right Pane Options. Calendar view for tasks gives you a quick understanding of the tasks & dates assigned to on-field staff. So you know, who is scheduled for which task on what date & who all are free for tasks. 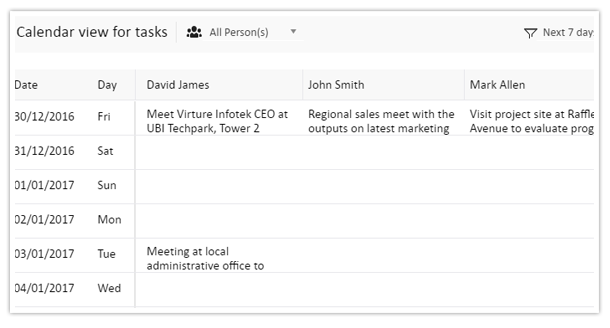 A new filter option on the ‘Tasks’ page helps you list tasks based on dates or period. You may now move all tasks from one stage to another without having to drag each one manually. Similarly, you could delete or archive all the tasks (in one stage) on the go. On-field staff can now send leave requests from the app itself; admin/user who receives a leave request on web may approve or reject the request. Those who are on leave will not get new tasks during the approved leave dates. On-field staff could now make use of form templates (user-defined) to fill up info related to tasks.